Investors choose stocks in the hopes that they will produce long-term returns that will turn modest investments into future riches. Yet typically, long-term investors don't expect to see dramatic gains come in a short period of time. Even the most optimistic of investors rarely expect to see a stock double in value in a single year. But some manage to reach that milestone, and a select few do even better. 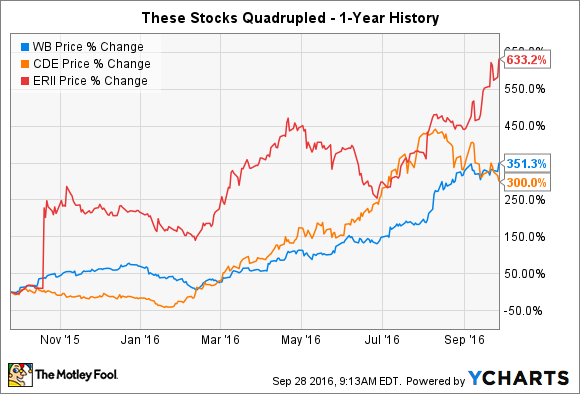 Below, we'll look at three stocks that have actually quadrupled in value in the past year, with the goal of seeing whether there are any gains left for investors looking at the stocks for the first time. The Chinese internet market has been one of the biggest growth opportunities on the planet for some time now, and microblogging site Weibo (NASDAQ:WB) has taken full advantage of interest in the space. For investors, the stock has been turbulent, initially losing half its value in the first year or so after its initial public offering. Since then, though, Weibo shares have skyrocketed, climbing roughly 350% since last September. Weibo has succeeded in getting users to adopt social marketing and increase use of video as part of its larger efforts to drive growth. In its most recent quarter, that produced earnings that tripled from year-ago levels, with revenue increasing by a faster-than-expected 36% compared to the second quarter of 2015. With more than 280 million monthly active users, Weibo should be able to keep gaining ground as long as Chinese government officials don't decide that the social trends no longer reflect what China wants to see from its public. Mining companies have suffered greatly in recent years, but with precious metals prices having perked up recently, many stocks in the industry have seen impressive recoveries. Coeur Mining (NYSE:CDE) is one of the most dramatic examples, with its stock having climbed 300% in the past year due in large part to the rebound in the silver market. Coeur is benefiting from two key factors. First, the fundamentals in the silver market broadly have been favorable, with demand for the white metal outpacing supply and putting pressure on prices to rise even further. Moreover, Coeur in particular has taken full advantage of greater interest from investors, choosing to set itself up for a future secondary stock offering that could help it improve its financial stability and raise a cash stockpile it could use for potential acquisitions. That combination of favorable trends could lead to even greater gains for Coeur as long as overall conditions remain relatively similar to what they are now. The energy industry has gotten hit hard over the past year, with most oil and gas producers having taken substantial losses. As a result, it's surprising to see a company with a name like Energy Recovery (NASDAQ:ERII) posting a gain in its stock price -- let alone a 633% rise over the past year. Yet the answer largely lies in Energy Recovery's particular combination of businesses. For the energy industry, Energy Recovery's technology helps protect pumps from potential damage, recovering pressure-related energy that results from the production process. An exclusive 15-year licensing deal with Schlumberger (NYSE:SLB) helped begin the advance in Energy Recovery's stock late last year, with technology designed to make hydraulic fracturing safer for the oil services giant's equipment. Energy Recovery also works with desalination, where it has 17,000 installations on seven continents in order to turn seawater into fresh water. By using hydraulic energy from one part of the desalination process to help drive other parts of the process, Energy Recovery dramatically reduces overall energy usage and associated costs. With financial results showing strong success and many seeing the company as a takeover candidate, Energy Recovery shareholders have been quite pleased with its performance so far. Investors shouldn't count on finding stocks that will quadruple in a single year, but all three of these companies have the capacity to produce more modest gains in the future. If things keep going well for their respective industries, then Weibo, Coeur Mining, and Energy Recovery could all make investors happy well into the future.